I hope everyone had a wonderful holiday and was able to enjoy the festivities with family and friends. The month of December is especially busy for us artists who accept commissioned portraits as gifts for the holidays. I promised to post the ones I completed for my clients for you to view. Below are the three I completed in Nov/Dec. The first one is a 11x14 memorial portrait of a dog named Katherine. This portrait was painted with soft pastels on Moorman suede board with Mt. Katahdin in the background. 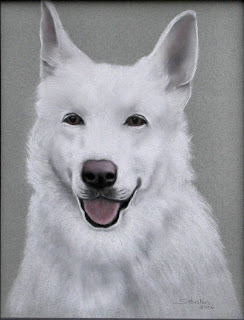 The next memorial portrait below is a 11x14 pastel pencil portrait on Canson paper, commissioned for a client in Vermont of his White Shepherd named Cain. 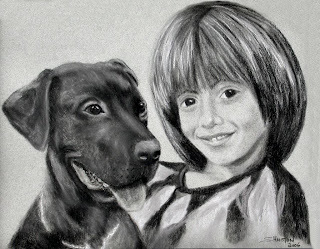 The last portrait completed was a 11x14 Charcoal portrait of a young boy named Chase and his dog Jaxson for a client from Washington State. I hope you enjoyed viewing my latest work as much as I enjoyed painting them for my clients. Wishing everyone a very healthy and Happy New Year ! For those of you who would like to purchase a copy of my book Loons of Tacoma Lakes (ISBN#0-9785143-0-0) as a Christmas gift, please call your local bookstores or gift shops to see if they still have a copy on hand. I have restocked my book in 30 locations throughout Maine, NH and VT . If you are unable to locate my book and still wish to purchase an autographed copy please email LoonsofTacoma@aol.com and I would be happy to mail you a copy. Enclose a check for 24.95 plus 5% tax (Maine residents only). Mail to my studio: Animals in Pastels, 162 Main Street Lisbon Falls, ME 04252 . For those of you who enjoy viewing loon and scenes of New England photographs please visit my new gallery at www.animalsinpastels.com/gallery here you will be able to view and order a selections of my new photographs captured in 2006 as prints, greeting cards, photo magnets and book markers. Loons of Tacoma Lakes is a spectacular book documenting a single family of common loons in the Tacoma Lakes region of central Maine. The author, Sandra Lee Huston, kayaked the lakes photographing and observing the loon family, and the book's wonderful, full-page images- over 40 of them-record the lives of the chicks from late summer through fall. My favorites aspect of this book is the spectacular photography. On every spread, there is a full- page color photograph showing another stage in the breeding life of common loons. All images are extremely sharp and well exposed. Natural history information about the loons is included in many of the photograph captions and descriptions. Some examples include the stage of molt the bird is in, feeding behavior, and the interactions between the adult and young loons. There is also basic life history information scattered throughout. For librarians who are interested in purchasing my book, I offer a discount of 30% off the 24.95 retail price, your discounted price is 17.46 + 1.95 s&h for each book ordered (for two books ordered s&h would be 2.95). For more information on ordering books email: LoonsofTacoma@aol.com If you would like to view more information about my book just visit www.animalsinpastels.com/loons-of-tacoma.html here you will be able to view 12 of the 40 photographs published in my book, read the preface page, bio and a sample of other review comments. Hope everyone had a wonderful Thanksgiving with family and friends and is not getting too stressed out with shopping for Christmas. I have been very busy with commissioned pet portraits for clients and marketing my loon book "Loons of Tacoma Lakes". Sales continue to go strong and we have just passed the $8,000.00 mark. Unfortunately we have not paid the printers bill yet, but we are hoping for strong Christmas sales so that we will see a profit by the beginning of next year. My 5th and next book signing will be at Percy's Burrow - located at the Lewiston Mall on East Avenue in Lewiston, Maine. You can find us between the Radio Shack and the Silver Feather between 1 and 4 PM on December 16th. 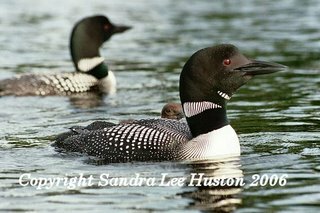 I will also have my new loon photographs, book markers, greeting cards and 4x6 loon photo magnets along with my autographed books for sale. Stop by and pick up some unique gifts for the loon lover on your gift list. Our last book signing in Meredith, New Hamphsire on October 28th at the Innisfree Bookshop turned out to be very nice even though the weather was particularly rainy that day. On our way home we stopped at The Loon Center in Moultonborough, NH and they also purchased 2 dozen books to sell during their Christmas open house. Not only can you find my book in gift stores and many independent bookstores throughout Maine, but now NH and just recently Stowe, Vermont. For those of you who cannot find my book at your local book store or gift shop, please visit my website here you can order by email or phone. I will be happy to mail you an autographed copy of my book- with free shipping and handling for December. 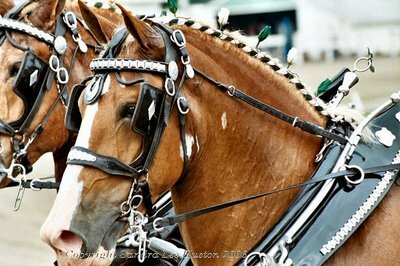 For additional gift ideas click on my Gift Shop page, here you will find an assortment of gift items to purchase including gift certificates for the animal lover on your gift list. Starting in December I will have a new Photo Gallery Album complete with shopping cart from which you can order one of several items easily by clicking on the drop down menu after selecting an image. You will have your choice of ordering greeting cards, magnets, digital prints also book markers. This will be a new item, so if there are any problems please feel free to email me to let me know. This new photo album will showcase all my Scenes of New England Photographs including my most recent loon photographs captured in 2006. And do not miss checking out my unique 24- month custom made calendars located on my gift shop page. Many are now ordering them with a new loon picture. After the holidays I will post my newly finished artwork for your enjoyment. Until then, wishing you all a safe and happy holiday ! Here is the digital photo of my latest portrait, hopefully it will upload today. This is of my husbands niece, Marlene and her 6 week old baby girl, Samantha. 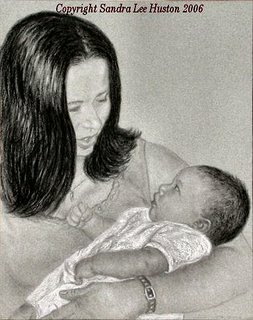 If you would like to commission a portrait of your children in charcoal, visit my website at www.animalsinpastels.com for prices and more information or email me at bornhorselover@aol.com. Have a great weekend. Well, summer is over and fall is fast around the corner. August was a very busy month for me. The Winthrop Sidewalk Art show/ book signing hosted by the Apple Valley Bookstore on August 19th turned out to be a great day. The rain held off and the turn out was high. Although the 80+ artist's reported that art sales were down by 50% from last year. I not only displayed my book "Loons of Tacoma Lakes" ( http://www.animalsinpastels.com/loons-of-tacoma.html ) but also my Scenes of Maine greeting cards, bookmarkers, 4x6 loon photo magnets, small 5x7 framed loon cards and a few 8x10 enlarged prints of loons. I did very well with my small items, it seemed that my bookmarkers, loon magnets and greeting cards made up most of the sales for the day. Besides continuing to market my book to the NEBA independent bookstores throughout New England I also managed to complete a few commissioned portraits. This 11x14 pastel portrait of an English Setter was for a client in NH. 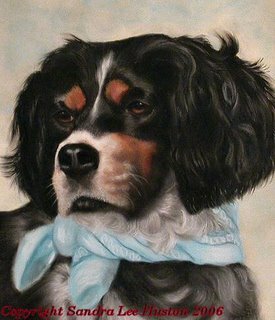 Jesse's dog portrait was painted on Rich Beige, Art Spectrum Colourfix Pastel Paper. 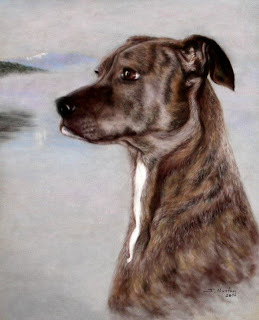 This next pastel portrait was also for a client in NH. 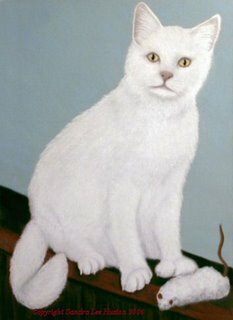 This is a memorial portrait of their beloved cat, Casper. My client wished to have their cat portrayed full size with his toy mouse and large double paws showing. Casper's, 18x26 pastel portrait was painted on Blue Haze, Art Spectrum Colourfix pastel paper. For anyone who is interested in commissioning a portrait for a Christmas gift there is still time. I accept orders up until Nov 1st. Please visit my website at www.animalsinpastels.com for more information on the styles of portraits that are available for you to commission. Gift certificates are also available for that someone special on your gift list. On my weekends at camp, (when it hasn't rained that is) I have continued to capture some more beautiful loon photographs at Tacoma Lakes. 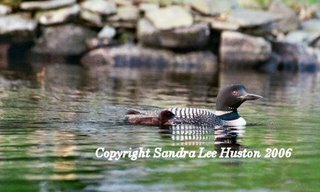 These new loon photos will make a wonderful calendar that I hope to have published and begin to market next year on line and at giftshops and bookstores throughout New England. Well, that is all my news for now, enjoy the Indian Summer weather everyone and have a great fall season. The Moxie Festival in Lisbon Falls, Maine on July 7th through the 9th was a great success, with lots of fun and sun for all, including great Fireworks to celebrate the festivities and of course our famous parade on Saturday morning. My book signing on the first two days of the festival was very encouraging. It was especially heartwarming to see people drive from as far away as Waterville just to meet me and have me sign their copy of my book, Loons of Tacoma Lakes. Sales from my new book continues to be strong. I now have my book distributed in over 28 locations throughout Maine, in bookstores, gift shops and sporting goods outlets. Reorders have started to come in as early as three weeks ago. Very encouraging! I also had a delightful meeting with the ladies of Altrusa International Inc. of the Pejepscot Area on Wednesday evening, July 12th. Jane Long the President, asked me to give their group a little demonstration of my artwork and talk about my new loon book. This is a great group of ladies getting together to volunteer their services in projects dedicated to community betterment. I had a wonderful evening talking with these ladies about my new book and artwork and enjoyed a nice supper with them at the Brunswick Cafe. I also continue to photograph the breeding loons at Tacoma Lakes on Sunday morning. I have documented 3 new breeding pairs on film, from Woodbury Pond so far this year, each pair with one newly hatched chick and also a pair that renested for the second time since the end of June. Below is one of the new breeding pairs captured on July 4th with its young chick hiding behind its parent. I should title this one peek-a-boo. 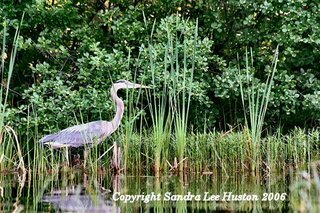 I was also extremely lucky to capture this shot below of a Great Blue Heron in the cove between Sand and Woodbury Pond from my kayak on Monday July 3rd. Hello, trying to catch up, as I have not been able to post as often on my blog page as I would have liked in the past 2 weeks. Memorial Weekend Photo opportunities were pretty good although not the best. 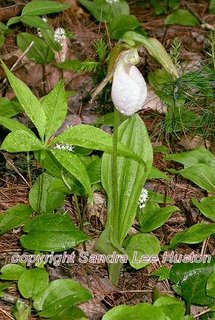 I was able to capture some lady slippers and a few loon photographs at camp, even though the rain has been on and off for the last 3 weeks (mostly on)! The birds and ducks are happy with all this rain, but it does not make for good photography outings for sure. Even the flowers in my garden are starting to develop rain rot. Not good at all. 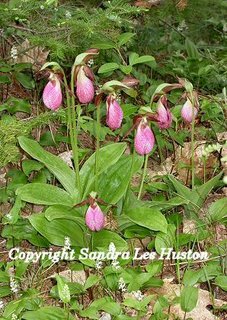 For all you floral lovers, here are a few of the lady slipper photographs I was able to capture at Beaver Park in Lisbon, ME. Even on this day it was partly cloudy and the pictures did not come out as bright as I would have liked. For those of you who enjoy florals you can visit my website at http://www.animalsinpastels.com/floral-photography.html this link will bring you to my floral page to view some of the other flowers I have captured over the years . At home I have been busy with my own garden and have tried to keep up with the weeds, when the rain has stopped. 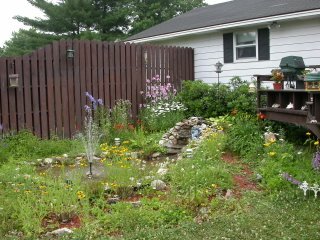 This is a picture of our back yard garden that we built when we removed our old above ground pool several years ago. Just wanted to say that I am happy to start my new blog spot, to be able to keep in touch with everyone and let you know what's new. I wanted to announce that I have just published my new loon book called "Loons of Tacoma Lakes" and wanted to report that sales have been very promising for the first month. I have sold and distributed over $3,200.00 throughout Maine since my book was first published on April 28th and I have enjoyed reading all the wonderful comments that everyone has emailed and mailed to me. I also wanted to thank Edward Turner of Bidderford, for his glowing review of my new book in the Book Nook section "On Maine Writers" in the Sunday - Sun Journal Newspaper on June 4th.
" You have created a very special volume. It is much more than a book of beautiful photographs of loons. The Completeness of the description of the life of the loons makes this a very superior volume, very unique. " " Your week by week journaling of this aspect of nature is fantastic, educational and profound. I welcome this gem to my classroom library." "My wife and I wish to compliment you on your fine work. We thoroughly enjoyed your book celebrating the love of loons and will cherish it for many, many years to come." If you would like more information about my book you can visit my website at www.animalsinpastels.com click on the loon book cover at the top of the page and it will bring you to a dedicated page where you will hear calls of the loons in the background while reading about my new book and view some of the photographs published. Loons of Tacoma Lakes is a book documenting the raising of two loon chicks from 3 weeks old to when they are fully fledged and ready to fly. 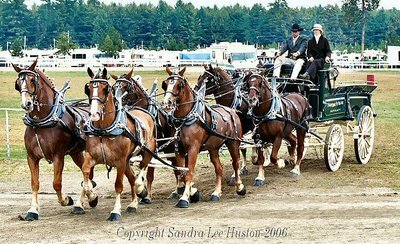 There are 40- 5x7 full color photographs in this large format 72 page book. My books make perfect gifts and a beautiful addition to any loon lovers library. Besides working on marketing my new book I have been busy taking care of the new additions to our family. Two- Five year old pygmy goats: Butterbean and Pepper. These little munchkins are fun to watch and have bonded very well with my Morgan mare "Rosie" in the month they have been with us. Below is a picture of them grazing in our back pasture. On Memorial weekend my husband and I were busy at camp on Woodbury Pond opening up our RV camper, cleaning and attaching the screened in porch. This is where I photographed all the pictures for my book(Tacoma Lakes) and will continue with documenting the loons again this year. I did notice that one of the breeding pairs is still nesting and the chicks had not hatched yet. Even as late as last weekend when we drove by the inlet during the rain on June 4th she was still sitting on the nest. Hopefully this weekend the rain will end and I will be able to kayak around the ponds and capture some more new and exciting photographs of the new babies just hatched. I promise to upload a few for you loon lovers out their to view if I capture a special one. Until then, take care, and have fun.